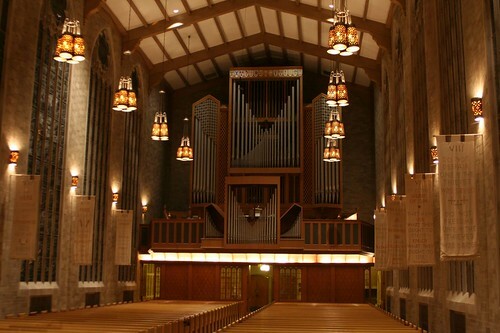 The Alice S. Millar Chapel (Edward Gray Halstead, architect, for Jensen and Halstead) is a highly visible landmark in the north shore suburb of Evanston, standing at the point where Chicago Avenue splits off from Sheridan. 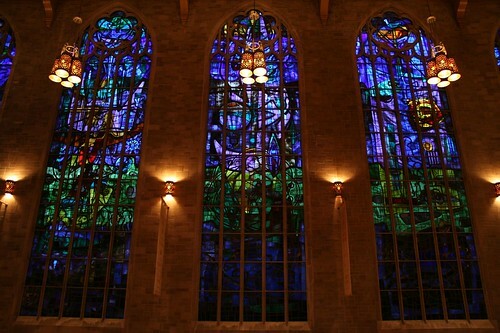 Its front window of stained glass is illuminated from within, making the building a beacon as well as an architectural mountain. The building is unabashedly French Gothic on the outside, so it might come as a shock to find that it was completed in 1962, the very height of Chicago’s MidCentury modern boom. Inside, one finds a spatially grand but comparatively unremarkable interior, most notable for its conflicting personality. There is no lavish Gothic ornament, no encrusted decoration, no mind-blowing accumulations of sculpture or articulation. Unwilling to admit its modern heritage, the building seems a bit ashamed of its historicist clothing, unwilling to go whole-hog with the neo-Neo-Gothic. 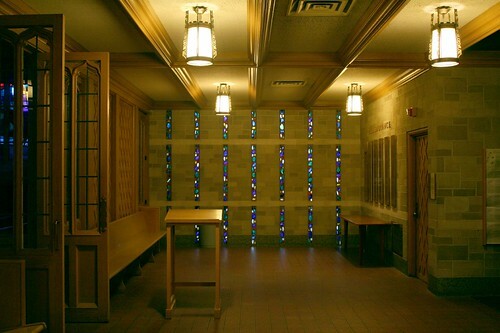 Amid the carved wood pointed arches and curlie-cues can be found anomalous touches of Modernism, such as the strips of faceted stained glass in the lobby wall. 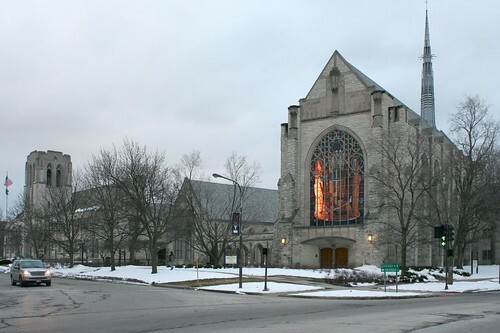 One thing does make the chapel truly exceptional, however, and it’s staring you right in the face as you drive south on Sheridan Road. 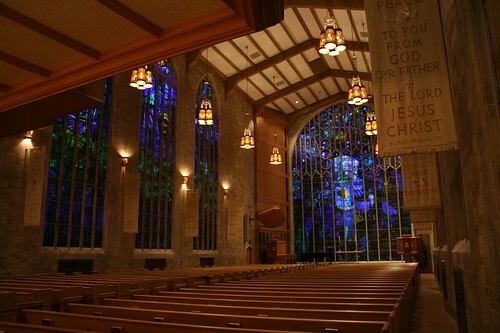 The stained glass windows are a masterpiece, and unlike any I’ve seen in Chicago. 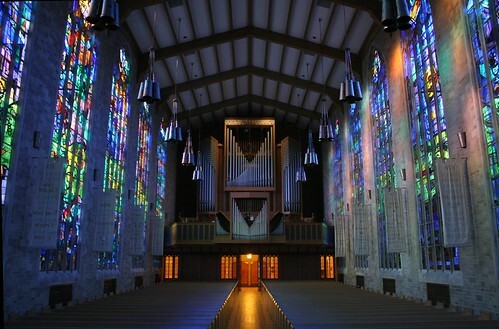 I am an unabashed fan of the MidCentury work that came out of St. Louis’s Emil Frei Studios. 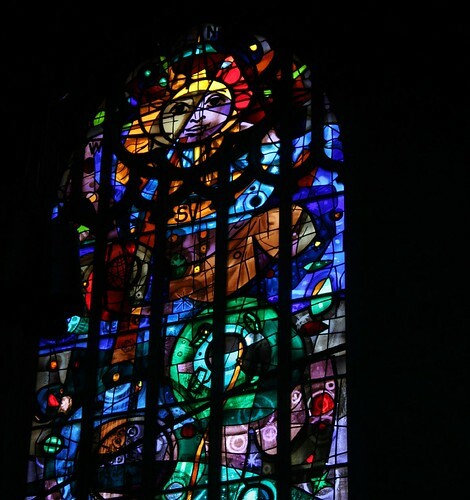 Their stable of artists created an interelated range of styles that took conventional Christian symbolism and broke it down, reinterpreted it, stirred it up, and let it explode onto window designs that are stunning portrayals of movement and feeling. 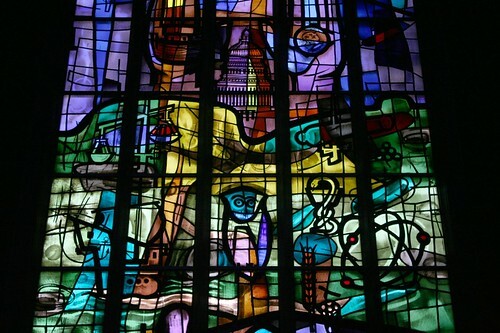 By contrast, Chicago MidCentury stained glass is almost universally bold, bright, almost cartoonish, rarely abstract, and never subtle or ambiguous. 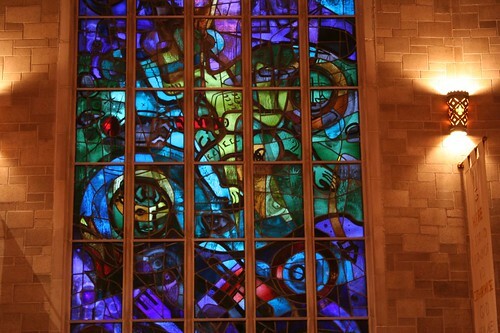 I love it, make no mistake, but 1960s stained glass in Chicago is more likely to blow your mind through its enormity than its subtlety. This was not some weak historicist brew, nor was it the usual Technicolor style of Chicago Modernism. This was artistry on a level to rival the Frei Studio at their peak. 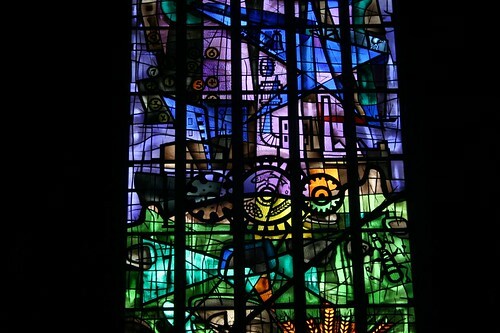 Within those traditional Gothic window frames seethes a cauldron of imagery and color, muted reds and greens and blues swirling and blending. Recognizable faces and bodies and shapes rise out of an abstract mix of shapes and lines. At the top of one window, a smiling sun watches over the cosmos. In another, the head of a cow floats in a bubble. An owl perches, an atom spins, the US Capitol Building looms, and human figures rise and fall to meet their unspecified fates. The meanings are obscure, eliciting thought and curiosity. The crowning glory is the rear wall of the chapel, where one of the building’s rare Modernist conceits occurs. 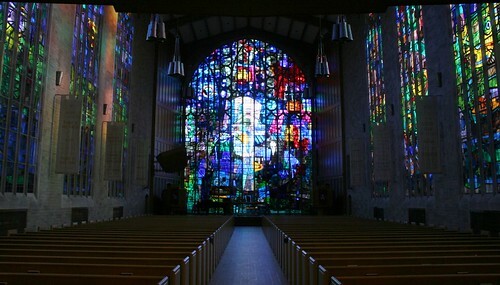 The entire rear wall is a window, top to bottom stained glass. Unsurprisingly, these windows were not the work of a Chicago artist, but of internationally renown designer Benoit Gilsoul, Belgian-born and operating out of New York City. 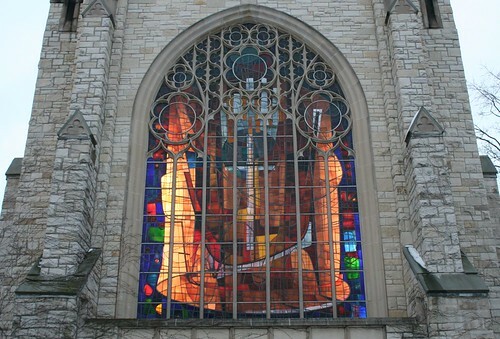 The windows were fabricated and installed by Chicago’s Willett-Hauser Studios. This entry was posted in historicist churches, Midcentury churches, Stained Glass. Bookmark the permalink. Hello! 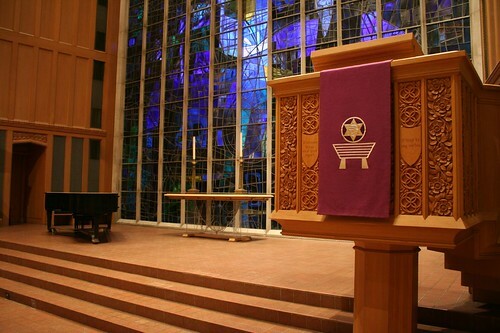 This was a fantastic write up on the stained glass program at the Alice Millar Chapel. However, I would like to point out that the windows were fabricated by the Willet Stained Glass Studio of Philadelphia, PA and designed by Benoit Gilsoul, as you mentioned, who freelanced for the studio. The Willet Studio, founded by William and Anne Lee Willet in 1898, was a contemporary of the Frei Studio. Now known as Willet Hauser Architectural Glass, the studio is located in Winona, Minnesota not Chicago.